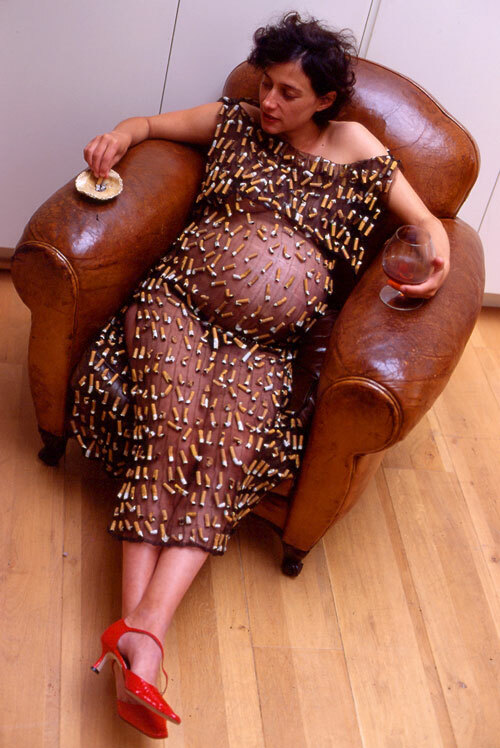 Pocket knitted dress containing 840 cigarette butts—a packet a week for an average pregnancy. If you carry on smoking during pregnancy you are more likely to suffer complications while you are pregnant. Although small, there is a greater risk of having a miscarriage, bleeding, your waters breaking early – which can lead to the baby being born with an infection, your baby being born prematurely, giving birth to a still born child or your baby dying soon after it’s born. On average a smoker’s baby will weigh 8oz (220g) less than a non-smoker’s. This may be because cigarette smoke reduces the amount of oxygen that the baby gets through the umbilical cord. Carbon monoxide – the lethal gas that comes out of car exhausts. Amonia, which is found in household cleaners. Cyanide which is extremely poisonous. Butane which is used in fuel lighters.